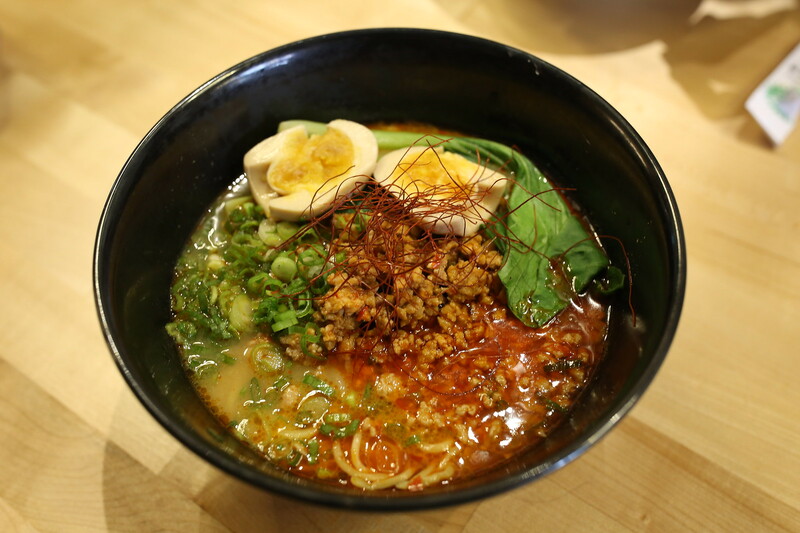 Shiba Ramen opened their second location in Oakland Downtown. I am so glad they finally can serve their ramen at an actual restaurant now. They still have their original shop inside "Emeryville public market," which is a food court that really limits their potential to serve pipping hot ramen. Anyway, I tried three ramen at the new location: Spicy, Clear (Shio), and Clear Dark (aka Shoyu Ramen). Out of all, I highly recommend Clear Dark, which its soup shows the strongest depth in flavor. As you can see, their Spicy Ramen is losing its structure at the time of serving: egg white is falling apart, egg yolk has a dull old yellowish color. no shininess on bok choy... Taste-wise, it is quite disappointing and light. I am not a spicy food eater, and even I thought the soup has no flavor but maybe some chili oil. The broth is way too light and watery to provide flavor for the ramen noodles. The only good part is the quality of the noodle, which remains chewy and wavy. (As expected from Nakamura's Sun Noodle) Ground pork also doesn't add the aroma and spice to the ramen. For the Clear Ramen, I chose pork (you can choose between pork or chicken chashu). As you can see, the half eggs are actually served in one piece. Yolk is orange and still in liquid form that looks more like a soft boiled egg. The soup base is too light and flavorless. 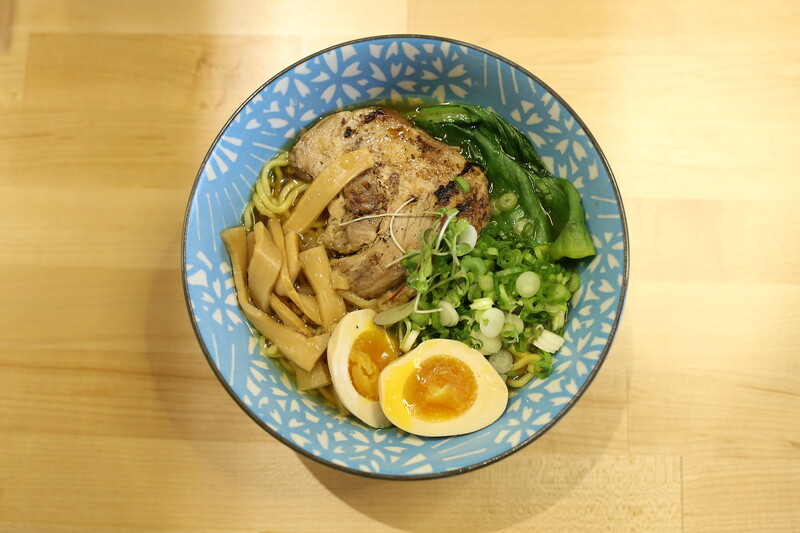 While you might expect Clear/Shio ramen to have no taste, that is absolutely not true. 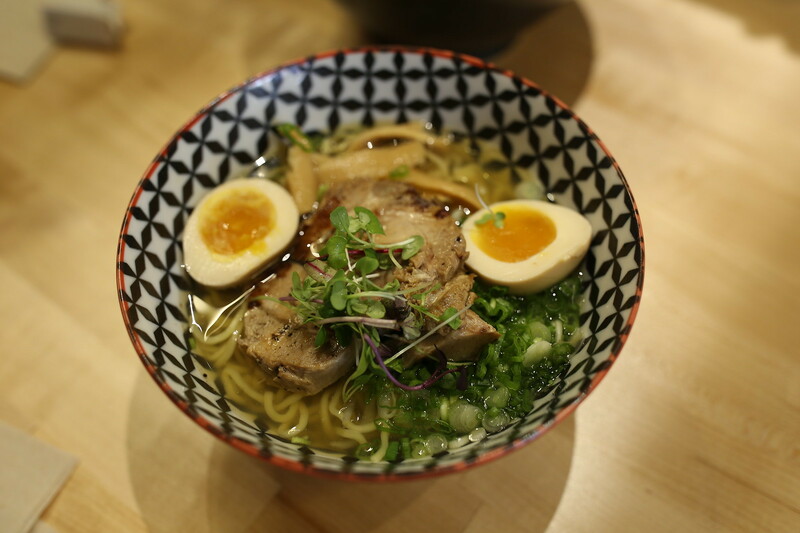 Although "Shio Ramen" means "salt ramen" in Japanese, the flavor is not simply water + salt. There is still a tasty broth base that could be made out of chicken, pork, seafood, fish, dried sardines, vegetable, kelp, herbs, and many other possibilities. And if you add salt to the right amount, it will enhance the broth to the right balance. While soup is not quite tasty, I wish the lean pork chashu can be served in multiple skinny cuts rather than a thick cut. This is the bowl I highly recommend at Downtown Oakland location! It is a shoyu(soy-sauce) based soup that is very different from the other two soup above. This one is tastier, savory, more umami, more depth. I enjoy it a lot with the noodle and toppings.